We produce magnetic seals for refrigerators and freezers, according to the following profiles. The seals conform to the BN-77/6359-04 standards. Their hardness falls between 73 and 87 Sh’A, the adhesion strength of the magnetic insert equals 0.3 +- 0.03 N/cm. We produce gaskets in colour for whites. We manufacture seals to the required dimensions, based on the following profiles. Non-magnetic seal (without the magnetic insert), soft, made from plasticized PVC. This is a hinge-side profile. It is most often used for cooling equipment with mechanical locks. The lower fin is mounted to the panel using metal screws. Available in white and grey. All seals of this profile are corner-welded to form a rectangular shape. It is also manufactured as 50-meter rolls. Soft magnetic seal made from plasticized PVC. Very modern (triple-chamber) profile with magnetic insert, 10x4 mm in size, using triple pole magnets S-N-S.
Has a long mounting fin. This profile is most often used for cooling equipment with flat panels. The seal is mounted using metal screws. 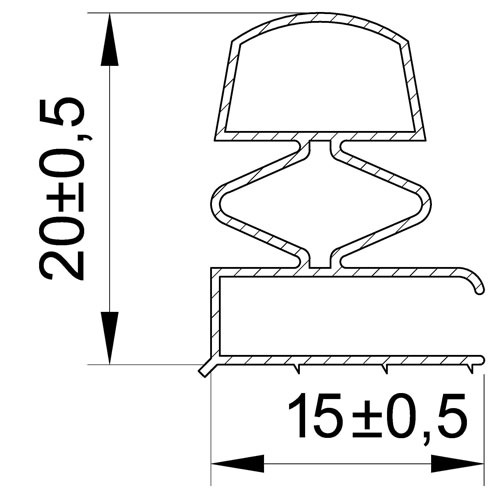 This seal is welded to form a rectangular shape, using this profile for all sides. Soft magnetic seal made from plasticized PVC. Very modern profile with magnetic insert, 10x4 mm in size, using triple pole magnets S-N-S.
Has a short mounting fin.This profile is most often used for cooling equipment with bevelled panels. The seal is mounted using metal screws. 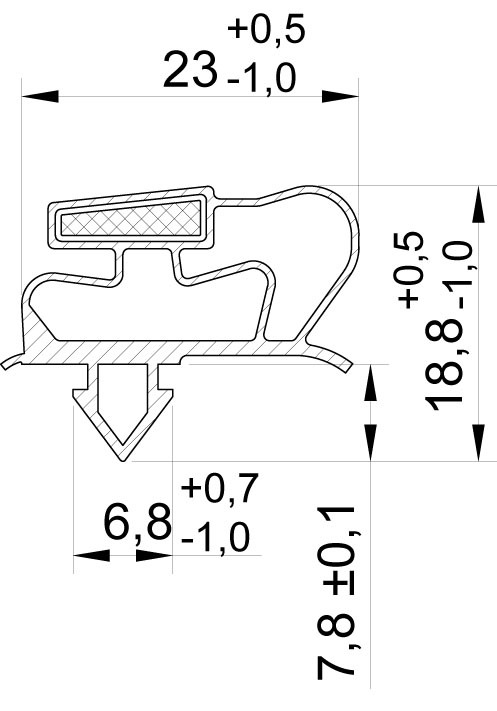 This seal is welded to form a rectangular shape, using this profile for all sides. Soft magnetic seal made from plasticized PVC. Very modern profile with magnetic insert, 9x2,7mm in size, using triple pole magnets S-N-S. Has a long mounting fin. This profile is most often used for cooling equipment with flat panels. The seal is mounted using metal screws. 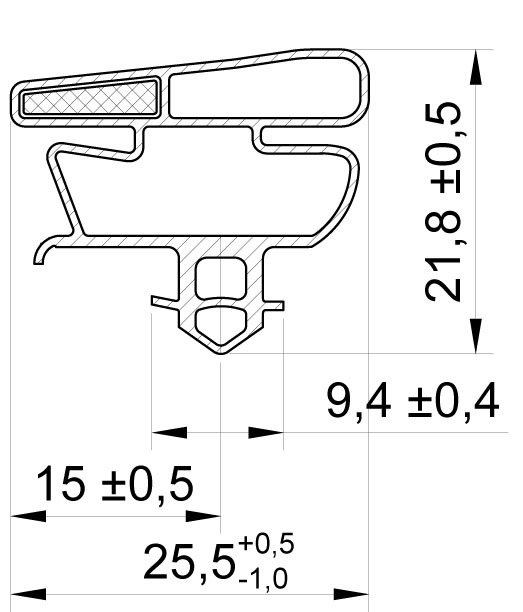 This seal is welded to form a rectangular shape, using this profile for all sides. Soft magnetic seal made from plasticized PVC. Magnetic insert, 9,5x2,4x1,4 mm in size, using triple pole magnets S-N-S. Gasket fixed for pressing. 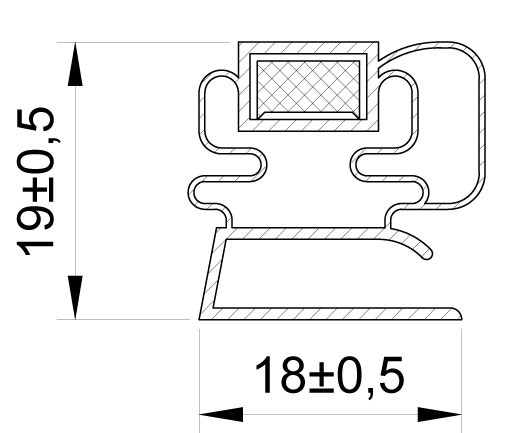 This seal is welded to form a rectangular shape, using this profile for all sides. Soft magnetic seal made from plasticized PVC. Magnetic insert, 9,5x2,4x1,4 mm in size, using triple pole magnets S-N-S. Gasket fixed for pressing. 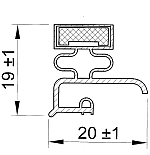 This seal is welded to form a rectangular shape, using this profile for all sides. Orders for this type gasket realize for larger series. Do not we realize individual orders. Non-magnetic seal (without the magnetic insert), soft, made from plasticized PVC. It is most often used for cooling equipment with mechanical locks. The lower fin is mounted to the panel using metal screws.